Zigadenus nuttallii (A. Gray ) S. Wats. Stems: Erect, single, glabrous, arising from bulbs .75 to 1.5 inch thick. Leaves: Mostly basal, arching, folded lengthwise, narrowly linear, to 20 inches long, about 1/2 inch wide when folded, light green, glabrous. Inflorescences: Racemes, terminal; subtending bracts thin, papery. Flowers: About 1/2 inch across, creamy white to greenish white, on spreading stalks 1/5-1 inch long; perianth segments 6, ovate; stamens 6, protruding beyond perianth; style 3-parted. Fruits: Capsules, about 1/2 inch long, 3-celled; seeds few, tiny, brown. Habitat: Rocky prairies, hillsides, and open woods, most abundant in limestone soils. Toxicity: Nuttall's death camass is highly poisonous to both man and livestock. Comments: Grazing animals generally avoid it due to its bitter taste. In early spring, the basal leaves can be mistaken for those of wild onion, and the plant has a bulb like an onion. However, the leaves of death camass do not have an onion smell or taste. It is named in honor of Thomas Nuttall (1786-1859), Professor of Natural History and Curator of the Botanic Gardens at Harvard University. 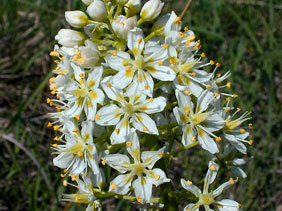 The common name death camass alludes to the bulbs being easily confused with the edible bulbs of Camassia.